There are plenty of knee walkers out there, and with such a large variety it could be a little challenging task to choose the best knee scooter (Walker). But don’t you worry – I’ve got you covered! With my guidance, you will be able to choose a product that fits all your needs! What Should You Look For In The Best Knee Scooter? Is The Knee Scooter Safe And Stable? How Comfortable Is The Knee Scooter? Does A Knee Scooter Have Brakes? A Knee Walker (Also known as knee scooter, leg walker, knee cruiser, roll about and many others) is the device used by people with ankle or foot injury to move around easily. It an effective alternative to crutches and wheelchairs. What makes knee scooters awesome is that they let you perform tasks that require higher-level of mobility. Without leg walker, the patients wouldn’t be able to execute the required task. A knee scooter consists of a padded cushion with wheels and handlebar. They come in a large variety of size. The most common are models with three and four wheels. Most of the walkers have a basket where you can put your luggage. Another noteworthy feature is that the best knee scooters have brakes on the handlebar. The patient puts his injured knee on the pad so that no pressure or weight is placed on the injured area. The handlebar gives you the ability to control the direction of the movement. Now you can feel the freedom to move! Before the knee walkers became popular people with foot inquiry were forced to spend most of their time in bed. In the best case, they could move with crutches or a wheelchair which is an unpleasant activity. Drive Medical DV8 is an ideal knee walker for those who are recovering from ankle or foot injury but want to have an active lifestyle during the recovery period! Ultra lightweight and easy to carry! Drive Medical DV8 is a high-quality knee scooter that is lightweight and easy to carry. At the same time, it lets you move around with freedom! Drive Medical has put lots of effort into maximizing the comfort a patient experiences when using their product. The cushion padded knee platform with “channel” provides added stability, comfort, and confidence. It’s soft enough to sleep on! Drive Medical DV8 is one of the most lightweight knee walkers on the markets. The frame is made of durable aluminum the and quality and the durability of the knee walker the highest out there. Drive Medical DV8 weights only 19 pounds and has the impressive weight capacity of 300 pounds! The cushion padded knee platform has a channel designed for maximum comfort and stability! Easily foldable, so it does not take much space. Deluxe braking system guarantees maximum safety and full control over the speed of the knee walker. Four 8 inch wheels. Ideal for indoors and smooth surface but works outdoors too! The brand KneeRover has a good reputation for providing high-quality knee walkers. 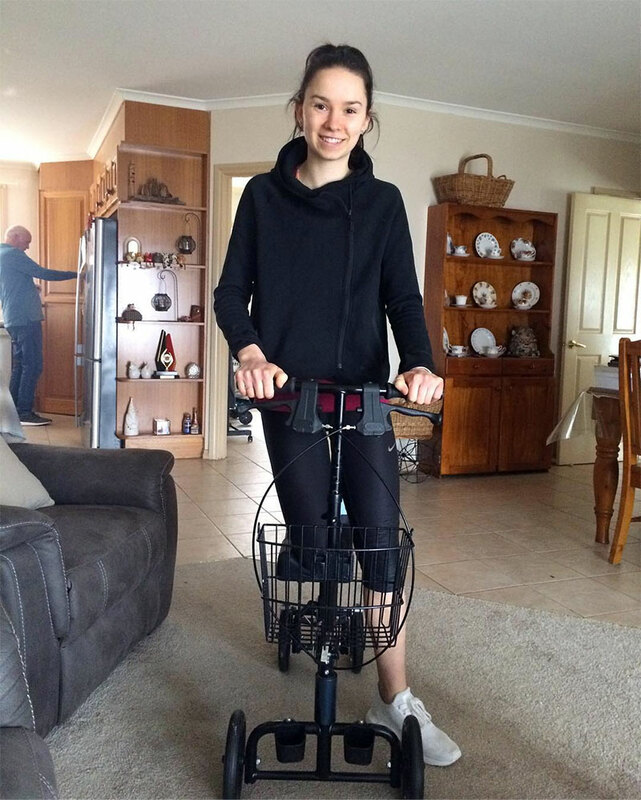 All Terrain KneeRover is a great knee walker, and if you want to remain active and participate and activities that require mobility, then you will love this knee scooter. The additional features that this walker provides set the price higher than the other products on the market but it is worth it every penny! Built to carry weights up to 400 lbs, you can safely go with this one without worrying about the weight capacity. This one is a bit heavy and thus more stable. 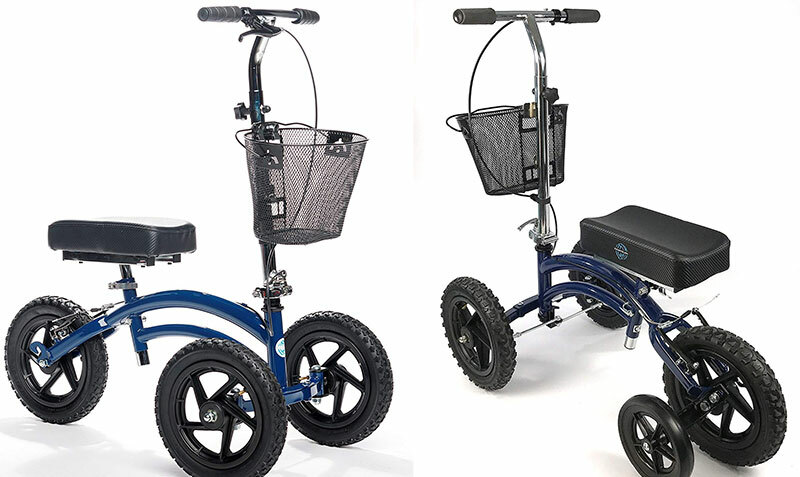 Its 12-inch wheels make it perfect for off-road (outdoors) making it the best knee scooter for uneven surface. It is suitable for patients with various height. Its handlebar and knee pad can be easily adjusted to adapt to the patient’s needs! Allow the AllTerrain KneeRover handle any surface! Designed for indoor and outdoor use, it has three, 12-inch pneumatic wheels that are specially engineered to let you go off-road. You can go on grass, gravel and almost any rough surface you can imagine! Ideal for participating in sports, or just hanging around your town! Works well on smooth surfaces too so you can navigate your home or office! AllTerrain KneeRover offers an advanced automotive style tie-rod steering mechanism which is not available on the most of the knee walkers. Its heavy duty double bar construction combined with the tie-rod steering mechanism make this knee scooter the most stable and reliable product on the market. Offering 400 lbs weight capacity, you do not need to worry about the safety when using it. All Terrain Knee Rover is ideal for individuals with heights 5′-6′ 5″ this scooter can be easily adjusted to fit your height. You don’t need tools to set up the desired height of the handlebar and knee pad. All Terrain KneeRover comes with an easy folding mechanism for simple transport when you can’t use it and economical storage. The weight of the walker is 27 pounds, and its weight capacity is 400 pounds which are more than most of the scooters out there. The overall height with handlebar folded and the seat removed is 19 inches. The Handlebar height range is from 35 inches to 47 inches. The knee support height range is from 19 inches to 22.5 inches. The knee pad is 6.75 inches wide and 12.5 inches long. Easy to fold, so you can carry it with you when you can’t use it! KneeRover is one of the most reliable brands in the industry. Choosing them, you’re playing it safe! This product provides exceptional stability and control while riding it! Roscoe Knee Scooter is a great solution for those who want to remain active while recovering from ankle or foot injury. This knee scooter offers increased comfort and mobility for those who cannot put weights and pressure to their feet. If you want to navigate your home and do your daily tasks and move around in your office – this tool is ideal for you! Roscoe knee scooter is equipped with four 8 inch PU wheels with seared bearings that guarantee the smooth ride. This scooter is designed for indoor and outdoor use but does not push it too far- it won’t work on grass or any rough surface. With Roscoe knee scooter you can navigate your home with great ease – the walker can be steered for increased maneuverability. Roscoe knee scooter weighs only 22.8 pounds making it easy to carry. The walker is equipped with the folding mechanism that collapses using a thumb release lever and fits beneath the raised knee platform, so it takes as much space as possible. These two factors make the scooter extremely lightweight and portable! Roscoe knee scooter works best for users with heights from 4 feet 11 inch to 6 feet 8 inch. It can be adjusted to your desired height with ease. The process is tool-free and takes less than three minutes. Comes with a basket where you can store your stuff while riding. The Handlebar height range is from 31 inches to 41 inches. The knee support height range is from 17.5 inches to 22 inches. Roscoe has a great reputation for providing knee scooters! With so many products on the market, coming in a wide variety of models it’s no wonder that some of them are complete rubbish. If you want to make sure you’re buying a high-quality product, take some time to read through this buying guide, designed to help you when choosing the right product. This is the number one priority. Look for units with large wheels – at least 7.5 inches in diameter – for increased stability. To help distribute the weight better, search for an offset knee platform. It should also steer like a bike, so you can navigate left and right easily, this will cut down on your risk of accidents. The best knee walker should be stable enough and offer an excellent brake system. The good quality knee walkers come with brake lock which allows you to put a brake to your walker when you’re not using it in this prevents it from rolling away. Going with a well-established brand increases the overall level of safety. You need to make sure that you will feel comfortable enough when using the walker. The best knee walker should offer a wide knee support, and handlebar height range will ensure you that the level of comfort is high. Also, make sure that the knee pad is big enough to rest your knee on with comfort. The cushion of the pad should be soft enough as you will place your knee on it. Search for a unit that includes 2 adjustable pads, which can be adjusted to accommodate any cast or boot. If you must stay active during your recovery, like continuing to work, living alone, or caring for a child or grandchildren, this will be an especially important factor for you. There is no need to say that you’ll need to select a product which weight capacity is greater than your weight. This way you will avoid situations that might damage your injury. Some scooters are designed to be used outdoors and some – indoors. 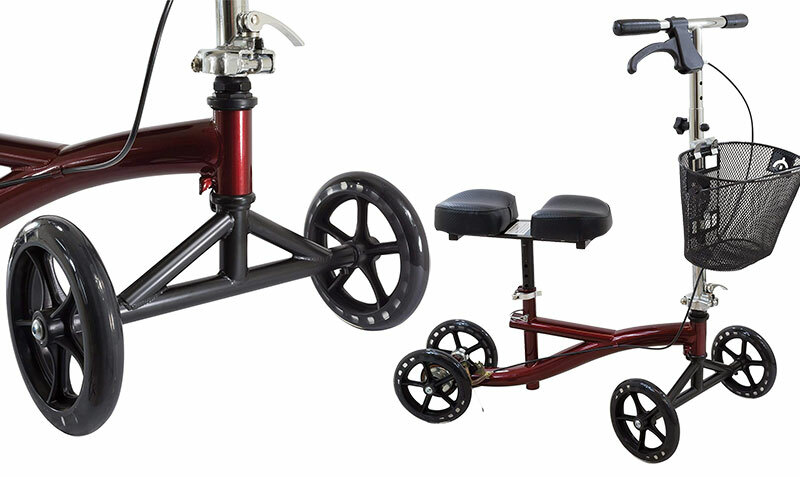 The size and type of the wheels determine whether the scooter is suitable for outside or inside. 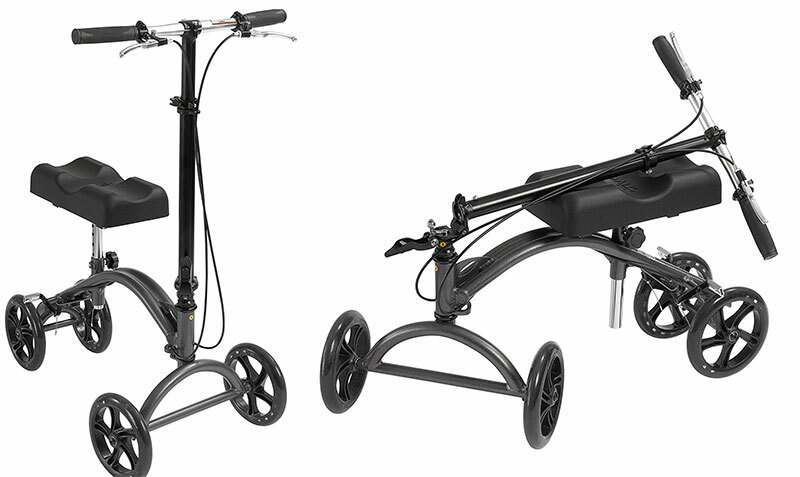 A walker with slightly bigger wheels – about 12 inch is suitable both for outside and inside. Those with 8-inch wheels are suitable only for use on the smooth surface. Needless to say is that you need to choose a product that fits your budget. You might be tempted to go with a cheap solution. The bad news is that they are low quality. However, If you can’t afford to spend much money, I would strongly recommend this scooter (the best value for the money). My piece of advice is to go with a well-established brand and not risk your money. There are many providers that promise high-quality providers, but most of them will not deliver what they have promised. Instead, choosing a brand with the good reputation will save you lots of money and efforts. The best knee walker should let you carry stuff with you when you’re transporting it. A scooter coming with a basket will do the job. It should not take too much space so you can easily store it. This is not as important as the other factors, but it should be taken into account. Look for different colors when you have chosen a model and pick the one you like the most. Many people with injury wonder if it’s better to buy or rent a knee scooter. Normally, the renting prices vary from $40-100 a week and might go up to $200 a month, and the purchase price is $150-300. From a financial point of view, it’s better to buy a knee walker instead of renting one ( having in mind that the mobility problems usually last more than one month). And the good news is that you can sell it once you recover! A low-quality knee walker may put your injured leg in danger of new injury. High-quality scooters are more durable and do not require maintenance. When you recover, you will be able to sell the knee walker and earn some cash back. It is a really bad idea to try and save money on your own health. Instead, play it safe and go with a high-quality product like those above. You’ll see the benefits in the long term, and you will not worry about your safety! The Knee Scooter (also known as a knee walker or by the original manufacturer’s name Roll-a-bout) is a wheeled device, and you might wonder how easy it is to operate. The best scooters turn just like a bike with handles on the front that you can easily operate to maneuver the device. It is stable and easy to operate so you can get around without any trouble at all. The Knee Scooter is a relatively small device, but it still looks large when you think about the fact that you will have to take it with you wherever you go. The good news is it folds up and can easily be stored or transported. Plus, it only weighs about 21 pounds so almost anyone can lift it, including you with your injury. You should be able to put it in your backseat, trunk, or even in the passenger seat beside you when you go wherever you need to go. It even fits on airplanes. Since you will be using your hands to steer the device, you might not be able to carry that much with you. Make sure the Knee Scooter you purchase comes with a basket and cup holder that you can attach to the front. You can put your keys, purse, phone or whatever else you need in the basket so you can take with you what you need without worrying about trying to hold too much and steer at the same time. Plus you will have a place for that morning coffee. It might not sound comfortable to kneel on the knee of your bad leg while you scoot around, but the best Knee Scooters have adjustable foam pads that can really make it a breeze. You can adjust the height of the scooter until it’s perfect for you and the foam pads help your knee from getting sore. The handlebars adjust as well so you won’t have to stoop over when you steer. Just remember: Nothing is perfect. While you’ll certainly have the ability to stay more active, you’ll also run into a few snags. You can count on the knee scooter for a safe recovery, as long as you don’t purchase one of the cheaper units. Your safety is important to us. A fall could re-injure your leg and require a longer recovery period, so don’t cut corners when choosing your equipment. The best knee walker will allow you to adjust for right- or left-leg injuries, which severely limits the stability. This universal design sacrifices your safety in the name of saving money. If, however, you invest in your healing by purchasing or renting a safe model, your safety will never be at risk. How much is a quick, relatively painless healing period worth to you? If you’re not comfortable in a kneeling position for long periods of time, no knee scooter will meet your needs. If you can handle the position needed to operate the scooter, you’ll still have other concerns to keep in mind. Again, quality promises greater comfort, and many knee scooter manufacturers will sacrifice that comfort in the name of saving money. Higher-quality units feature thick, contoured, dual-adjustable padding to protect your joints, muscles, and bones. If you opt for the less expensive models, a thin, one-piece bench-style pad will not offer the same support. Trusting your healing to equipment on wheels can be a little nerve-racking. Knowing you have the ability to stop with ease and stay at rest without your knee scooter rolling away can bring a lot of peace of mind. Before you order a scooter, make sure the brakes are of the highest quality. The types of brakes vary according to cost, so you could end up with a knee scooter that rolls away without you if you’re not careful. The cheapest units have a simple bag that contacts the tread of the tires. These types are easily overcome with the slightest force. Bicycle-style brakes are another option. These are much better, as the work just like a bike brake does, with a pinch to the wheel from the side. Your high-end options are the drum or disc brakes, which work like the brakes of a car for smooth stopping and a steady hold. A parking brake is also necessary to stay at rest. You don’t want your knee scooter to roll around while you’re trying to do everyday things like brushing your teeth or washing the dishes. Even more importantly, that scooter should hold still while you’re stopped at crosswalks or in other high-traffic areas. If you choose the right knee scooter, this will never be a problem. Many people choose a knee scooter as an option to crutches while recovering from one foot after surgery or injury. Also known as a Knee Walker these wheeled cart-like devices provide mobility, stability, and comfort you can not get from old fashion crutches. The knee platform MUST be adjusted to the correct height. Incorrectly adjusted it will put either too much or too little weight on your good leg. This can lead to knee pain, back pain and increased effort to propel the scooter. So what is the correct height? When standing still with your injured leg on knee platform, your GOOD LEG should be slightly bent. If your good leg is fully extended or worse, your heel is not on the ground you are putting too much weight on your injured leg. Conversely, if the knee on you good leg is bent, you are putting too much weight on your good leg. Minor adjustments can make big differences. Remember it may be necessary to adjust the platform height depending on the thickness of the sole worn on the good foot. The better knee walkers have pads that can be adjusted to be closer together or farther apart. Adjust the pads, so they give you the most support without pushing on your cast or bandage at a place that causes discomfort. Even if you have a cheap unit with a single fixed bench seat, you can add padding toward the front or back to customize your knee scooter for comfort. This additional padding could be anything from foam rubber to a small folded towel. While a minor adjustment, offsetting the knee platform toward your good leg greatly improves the stability of the knee scooter while keeping your good foot and ankle clear of the wheels. Most modern knee scooters can be adjusted for either LEFT or RIGHT leg injuries. Ensure your knee scooter is set up correctly (offset towards your good leg). If you have an older or inexpensive universal unit, make sure you aren’t placing your knee in the center of the pad, but closer to the edge near your good leg. You see? Using my guide, it is not that hard to find the knee scooter that fits your need! I hope you find the best knee scooter reviews useful! Have a good day and happy knee-walking!